This type of “pocket” battleships existed in any second or third-rate navy alongside torpedo-boats for self-defense purposes. With still relatively big guns and decent armour, they were a potent deterrent in 1914. But in the 1890s they were the cornerstone of the Austro-Hungarian Navy. The Monarch class has been the first to used proper turrets instead of barbettes. They served for the duration of ww1 but Trieste was sank in 1917. 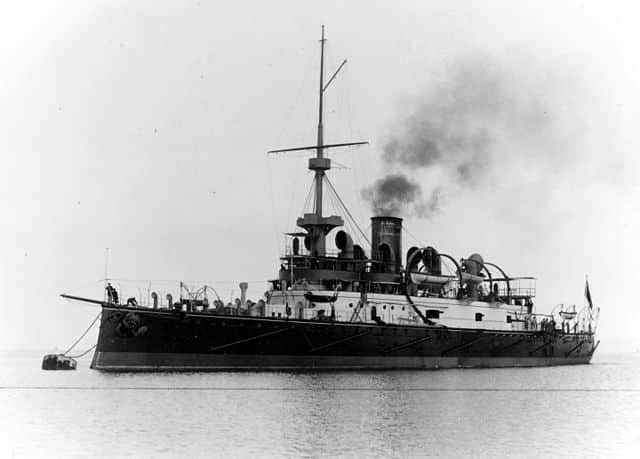 By 1890, SMS Kronprinz Erzherzog Rudolf and SMS Kronprinzessin Erzherzogin Stephanie were former sail ironclads dating back from the 1870s, although modernized, they were hopelessly outmatched, in particular by 1880s Italian Brin’s battleships. 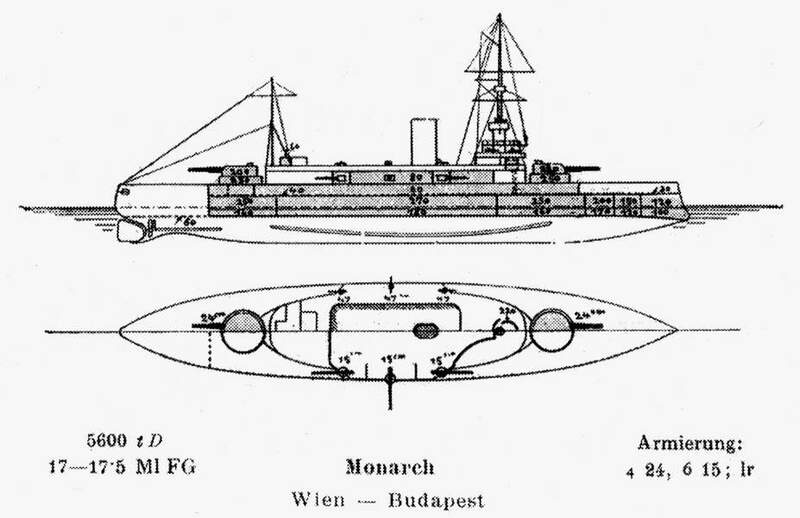 By 1893, funds were available to build three new battleships, but the Hungarian and Austrian parliaments only authorized coastal defense ships according to the naval policy of the day. Indeed displacement was to be about 5,600 tonnes (5,512 long tons). The new ships were named Budapest, Wien, and Monarch. They were the brainchild of the newly appointed director of naval construction, Siegfried Popper. The first two were built at Stabilimento Tecnico Triestino yards in Trieste and the Monarch at Naval Arsenal in Pola. They were laid down in 1893, launched in 1895-96 and commissioned in 1897-98. The three ships displacement was about 5,878 tonnes (5,785 long tons), making them early “pocket batteships”. Their armament was not negligible though, with four turreted 240 mm (9 in) L/40 guns, six individual masked 150 mm (6 in) L/40 guns, ten 47 mm (1.9 in) L/44 and four L/33 guns, one 8 mm (0.31 in) MG gun, and four torpedo tubes. Later in the war, in 1917, a Škoda 7 cm K16 anti-aircraft gun was added on two ships but the SMS Monarch, which contented with an older L/45 BAG. All three ships were fitted with Harvey armour. Belt armor thickness was 270 mm (11 in), the turrets had 203 mm (8.0 in), the conning tower 220 mm (8.7 in), the deck by 64 mm (2.5 in) and the redoubt and casemates 76 mm (3.0 in). Crew was 26 officers and 397 sailors, 423 personnel total per ship. Propulsion varied by ship. Budapest used 12 coal-fired Belleville boilers without economizers, giving an output of 9,180 hp (6,846 kW) for a top speed of 17.5 knots (32.4 km/h; 20.1 mph). Wien and Monarch had coal-fired cylindrical boilers and vertical triple expansion engines giving 8,500 hp (6,338 kW) for a maximum speed of 15.5 knots (28.7 km/h; 17.8 mph). Monarch-class ships normally carried 300 tons of coal, with a maximum of 500 tons, for a range of about 2,200 nmi (4,100 km), quite sufficient for extended raids in the Adriatic. Soon after being commissioned, the Budapest, Monarch and Wien began a cruise around the Adriatic and Aegean in 1899 to display the flag in foreign waters, as the Ist Battleship Division. Early on Wien participated in the Diamond Jubilee of the crowning of Queen Victoria in 1897 and the international blockade off Crete during the Greco-Turkish War of 1897. The newly completed SMS Habsburg conducted a training cruise with the three Monarch-class battleships in January 1903, and the next year, they were joined by the SMS Árpád. 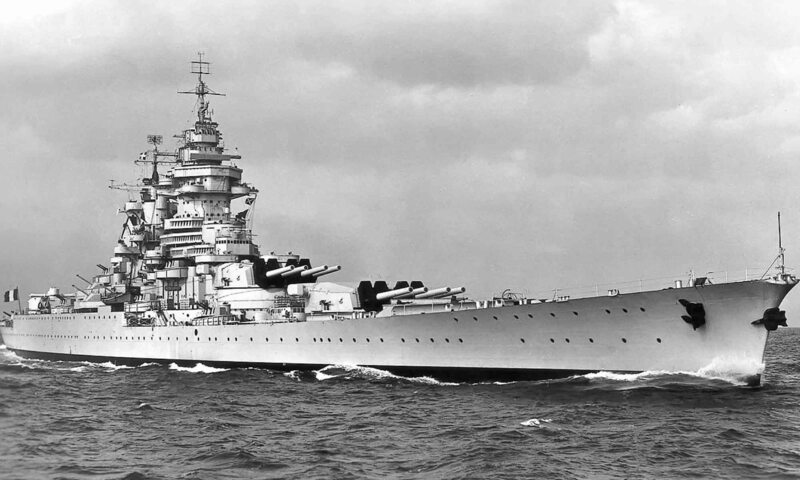 Eventually the three Habsburg-class battleships engaged the three Monarchs in simulated combat. The three new ships also were given the 1st Battleship Division while the three Monarch were versed into the newly created 2nd battleship division, which was changed to the IIIrd, IVth and the Vth with the arrival of the Erzherzog Karl and Radetzky classes. 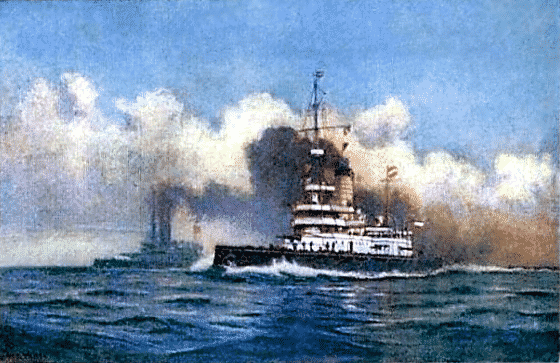 In 1914 the Monarch class served as coastal defense ships, training ships, and bombarded coastal positions during the early years of the war: Budapest was transferred to Cattaro to shell Mount Lovcen, Monarch shelled the French radio station at Budva, Montenegrin radio station off Bar, as well as the barracks and radio HQ at Volovica Point in August. On 28–29 December 1915 Budapest participated in the aborted raid to Durazzo. In January 1916, Budapest shelled fortifications on Mount Lovcen, helping capture the city while Budapest and Wien shelled Italian troops in the Gulf of Trieste. However the latter were torpedoed on 10 December 1917, by two Italian boats which managed to penetrate the port of Trieste undetected. Wien was hit twice and sank in less than five minutes, Forty-six men going down with her. 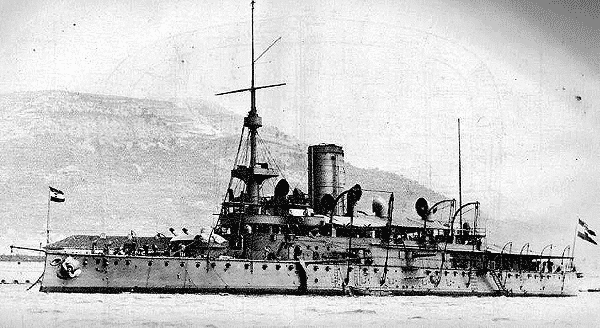 Her executioner was MAS 9, manned by Luigi Rizzo (He also sank the Szent Istvan dreadnought) which became a national hero at home. 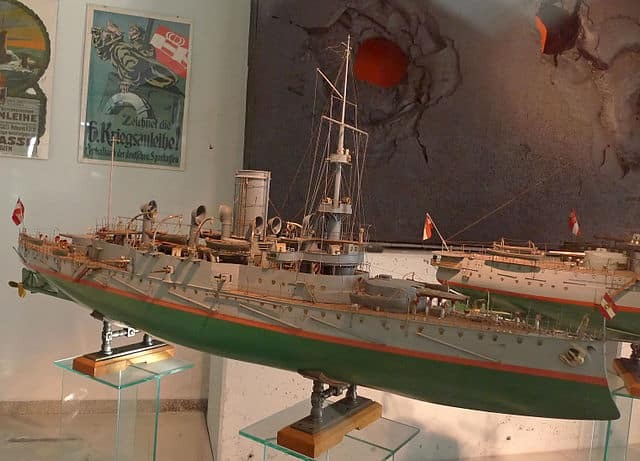 Budapest was demoted to a floating barrack for German U-boat crews, but in June 1918 she received a 380 mm (15 in) L/17 howitzer in her bow for coastal bombardment, which was never used. The Monarch was anchored at Cattaro when in February 1918 a mutiny took place on board. The two ships were handed over to Great Britain as war reparations and left to UK which sold her to be broken up in Italy in 1920 and 1922. In 1914, replacement were planned, the Ersatz Monarch-class, which were improved Tegetthoff class dreadnoughts.